Mexico avoided a letdown Saturday after upsetting Germany to start the tournament, handling South Korea by a 2-1 score But Mexico (six points) isn’t safe yet. A dagger by Toni Kroos deep into extra time gave Germany (three points) a 2-1 win over Sweden (three points) in Saturday’s late game. If the defending champion beats South Korea on Wednesday and Sweden simultaneously tops Mexico, three teams would finish with six points, sending it to tiebreakers that start with the best goal differential. 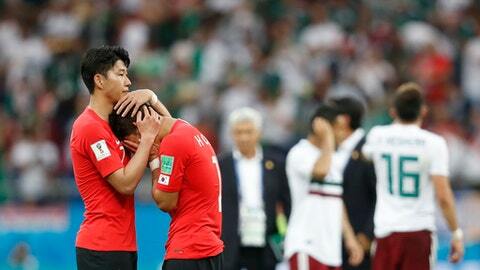 On the other hand, if Mexico and South Korea win, Mexico would win the group and every other team would be tied. Belgium’s second straight emphatic win, a 5-2 drubbing of Tunisia on Saturday, has it atop the group with six points and all but guaranteed to go to the next round. England (three points) can send itself and Belgium through if it knocks off Panama on Sunday, though Panama and technically even twice-beaten Tunisia are still alive.